Upcoming new graphics engine: Will current skins be compatible? I have been taking a look at the files from the sandbox build, and it seems the tanks use the same files/structure, so current tank skins may be compatible at first glance. .havok files inside the collision_client folder for each model (guns, hull, chassis, turrets). Tank skins dont mess with collisions, so we can just ignore this files. .vt files for hull and turrets inside the normal/lod0 folder, and only in that folder. Oddly, the .vt files are not referenced in the xml, model or visual files. This files have me intrigued. Edited by HiBan, Oct 10 2017 - 23:47. They may render differently with new texture shaders, but the colormaps should be ok. I wouldn't worry about this issue for a while. The Sandbox testing is to start tomorrow. What's that mean? The changes are a long way off especially since not all the maps are even done yet. Yes. Skins will be fine. Ive tested one of my remodels on the sandbox. The only change is that the vt files will have to be packed in with your remodels. They control the appearance of emblems and inscriptions now. I thought the emblems/inscriptions were already defined into the xml. What happens if you dont pack the vt files into the remodel? Wouldn't the game load the vanilla vt files by default? That's what it always did before. Edited by HiBan, Oct 12 2017 - 11:17. When I tried that it just didnt display any emblems or inscriptions. When I copied over the files it changed. It may read the files if you tank remodels are in the vanilla folder, but my remodels are in a custom folder. I've noticed that, if the "_AO" texture in a given area of your tank has total transparency (0% opacity), then the tank will not get dirt effects on that area. So for example, if you made a custom "AO" texture to get camo on the track wheels, you may have to apply a 95% transparent layer on top of the entire "AO" texture so the dirt effect gets applied to the entirety of the wheels and at the same time the opacity is too weak so you don't get camo paint in the parts you don't need it. Anything which is not "100% transparent" should work, as the dirt effect seems to be either enabled or disabled, with no steps in between. 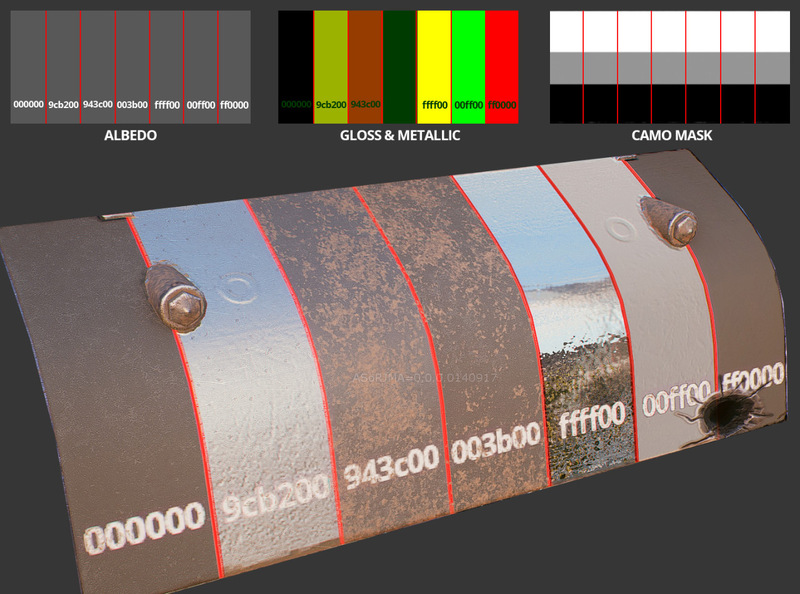 The dirt map you see accumulating on tanks isn't affected by anything that's in the alpha layer of _AO, that channel is specificly reserved for camouflage masking. The maps that affect where dirt occlusion is displayed are the red and green channel of GMM and also the red and green channel of AO. Basically the dirt is overlayed on top of the entire tank but in different strengths depending on light values. Full white (255,255,255) gets a very subtle overlay but it starts to ramp up going from (210,210,210) to (150,150,150). Here are some images for better visualization. 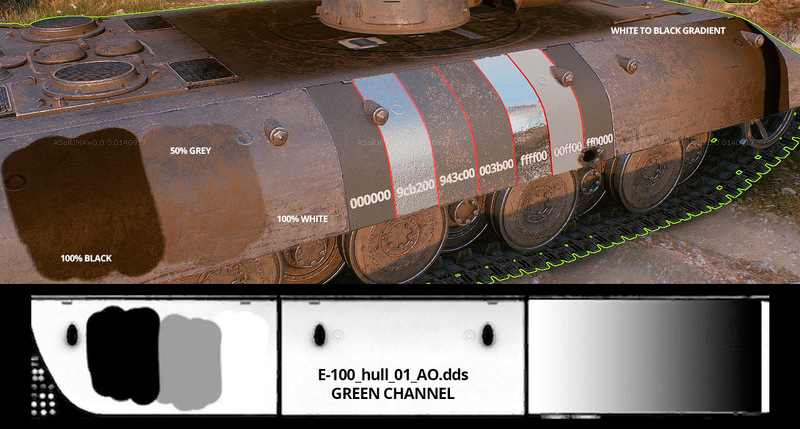 WG also added those .vt files to the game which from my understanding are responsible for how decals on models are displayed. In the current version of the game each primitive file includes a respective BSP mesh which is used for projecting decals onto the model. This isn't an issue as of now because the 3ds Max exporter is able to create a BSP on its own during model export. Now with the changes WG did on Sandbox each tank will require a .vt file for the hull and turret and this file can not be created by us remodelers. Until someone figures out a way to output a custom .vt file you either have to live without decals being displayed on your model or use the vanilla .vt files. Using the vanilla ones does limit you on where you can place emblemSlots and the other problem is that hit decals like penetration marks you can see on the E100's side skirt will not be displayed on custom parts of your remodel. This is an E100 where I swapped the turret with the Leichttraktor's turret and you can see the decals are still where they would intersect the original E100 turret. Well, at least we'll have visual markers of where our hitbox is lol! But seriously, that's pretty in depth stuff and one hell of a great explanation, nice work Milky. Hopefully they'll make the .vt files something we can edit and reconfigure for. Cause obviously this will have an impact on not just remodelers like yourself but even myself in the process of model swaps, I'm assuming model swaps should be less problematic by swapping the appropriate .vt files as well yes? Thank you very much. Indeed, model swaps shouldn't be a problem. When doing one just include the .vt file and it will all be good. This problem only affects models that had their geometry changed from the original. As far as i know, the color on the AO map influences how the color of the tank gets shadowed. For example, a darker orange made darker shadows than the usual brighter yellow AO mask. Dark grey makes even darker shadows. 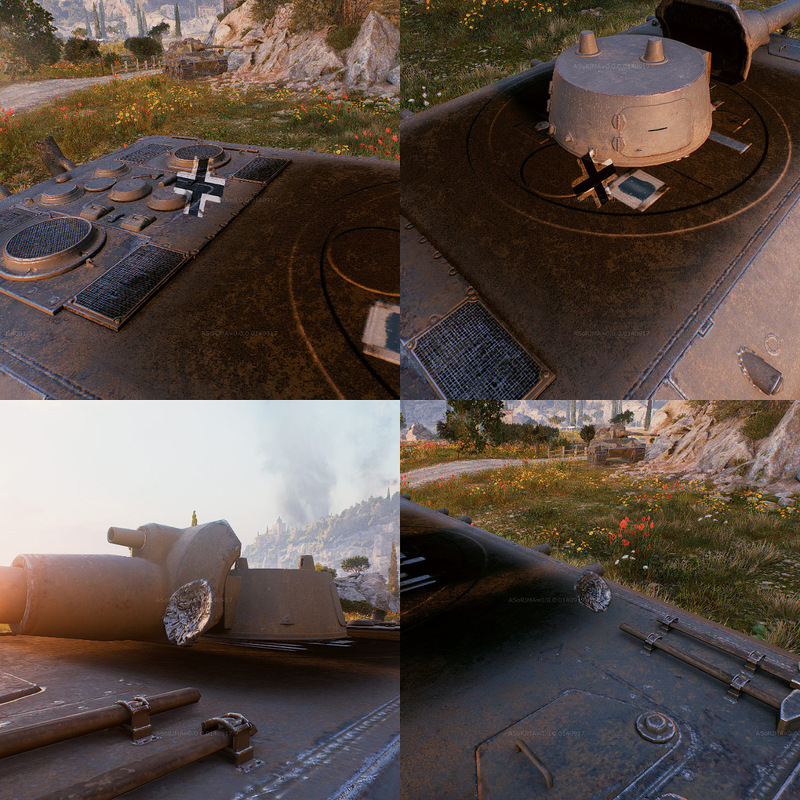 As for the dirt maps, what i explained in my post is what i found when i noticed that the custom AO map i was using on my test tank didn't provide any dirt on the tank wheels but at the same time the metallic rims (which had camo support) were getting dirt effects with no issue. The same issue happened on all the canvas/backpacks/extra details i added to the tank model. I noticed the AO map was 100% transparent just on the parts which had no dirt, so i added a 95% transparent yellow-orange layer on them, and then the dirt maps started to work perfectly. You can download my Cobra King tank and see that it gets dirt effects everywhere EXCEPT on the parts in which the AO mask is 100% transparent. Of course, i've already fixed it (and added some more eye-candy to the tank), but haven't updated the download links yet, so you can still see the issues. I don't really like the VT files a bit. Now i have "floating hole" issues in some tanks, and that's not good. Hope someone finds a way to edit them. Edited by HiBan, Oct 21 2017 - 20:16. Forget colors. You need to look at the AO map on a channel by channel basis. The reason why orange get more dirt applied to it is because it has a lower green value than yellow. Dark grey is probably just even darker in the green channel than orange. The dirt map isn't affected by what's in the alpha layer of the AO map as I've already posted. I've replaced your chassis AO maps with a vanilla one and dirt still does get displayed on the model. In fact there's more dirt on the rubber parts also using the vanilla map. Next up when replacing the Extras textures with vanilla Hellcat turret_02 ones dirt starts displaying on the green backpacks and whatnot. The backpack UVs lay in a completely black part of the camo mask(AO alpha) and yet still there's dirt on them. So your theory of AO needing 95% transparency is completely false. Dirt doesn't display on metallic parts the same camo doesn't display on the same surface. It gets masked out by the shader. As for the .vt files there might be a solution for that down the road but nothing can be said as of now. Ok, orange works for me anyways, so i'll use that. Looking forward to knowing more about vt files. Edited by HiBan, Oct 22 2017 - 00:08.